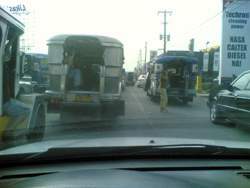 Today was the worst traffic in the history of Novaliches! 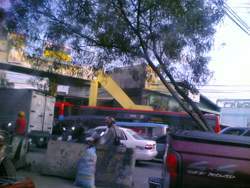 A construction has been on-going in the intersection of Mindanao and Quirino Highway for quite some time now. The purpose of this construction is to build an underpass to ease the traffic in this high volume intersection. But before we could get there, the authorities decided to give us HELL first. Maybe they're thinking, light in the end of the tunnel perhaps? Anyways, today, as usual, my son got ready for school. We left the house at 7:15, we reached Mindanao Avenue at 8:15. What's wrong with this, you say? WE ARE 2 KILOMETERS AWAY FROM� MINDANAO AVENUE!!!!!!!!!!!!!!!!!!!! 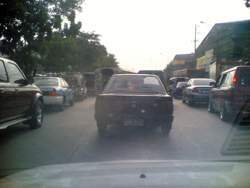 The 2KM drive, supposed to be 8 minutes from our subdivision, to Mindanao Ave became 1 HOUR!!!!!!! 1 HOUR!!!!!! Can you imagine driving 2 kilometers for 1 HOUR!!!!!!!!! It would have been faster walking!!!! 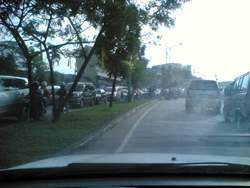 What happened is, authorities decided to hasten the construction and just leave only one lane open in Mindanao Avenue. The volume of traffic coming from the subdivisions inside Bagbag and San Bartolome and even General Luis, vehicles from Quirino Highway going to the other side, vehicles from Valenzuela, vehicles from Mindanao going to Talipapa, all need to pass by this one lane!!! Just image the volume of traffic in EDSA Guadalupe passing in one lane full of rubbles. Literally HELL ON EARTH!!!!!!! Authorities should consider the motorists. They should consider the money/business lost in these situations. They should have planned detours. They should have at least thought of something to ease our pain!!! This is a national government project, if it was Mayor Sonny Belmonte managing this project, this wouldn't have happened. The people of Novaliches are calling for your attention and for your action Mr. Mayor. We have complete confidence in you sir. I just hope someone could let him know of what is happening here. Here is another rant from another blogger, skamid.com. Maybe if we write more about this, we'll get some attention! things are getting worse day by day - parellel excavations are on going on in the talipapa area too. herbert So, where's the pic of the heavy traffic? Marcel Sorry about that. I updated the entry with pics. Cheers!!! Karl "Literally HELL ON EARTH!!!!!!!" I couldn't have said it better! Just in time for the coming elections too! How convenient is that? Marcel Exactly!!! Every 3 years, there is a major road construction in our area. Usually christmas season before election! Well, just reminds us who NOT to vote! dimaks hi Marcel.. sorry I could not put up another link my post on this subject due to some post restriction *wink* but i made a reply on your comment with a link back to your post. Marcel Alright! Thanks for the update!!! Mark M.V. Salin Even the staff and talents who work for ABC-TV5 also complain about this traffic jam, so they are forced to take Commonwealth > SM Fairview > Quirino > Nova Bayan going to Channel 5 (which is a bit longer yet less congested route). Hi Mark Yeah, but that route is a bit too far away for me. I'm closer to the Gen. Luis, Balintawak route. Although Gen. Luis can be congested at times too. Joe Whoever thought about this underpass idea while clogging up one of the busiest roads in the metro should be jailed. Hell on earth every time we enter this portion of Mindanao Ave.